Author: Valentina Zharkova, Malcolm Druett and Eamon Scullion at the University of Northumbria. Observations of solar flare onsets show a rapid increase of hard and soft X-rays, ultra-violet emission with large Doppler blue-shifts associated with plasma upflows, and Hα emission with red-shifts up to 1–4 Å [1, 2, 3]. 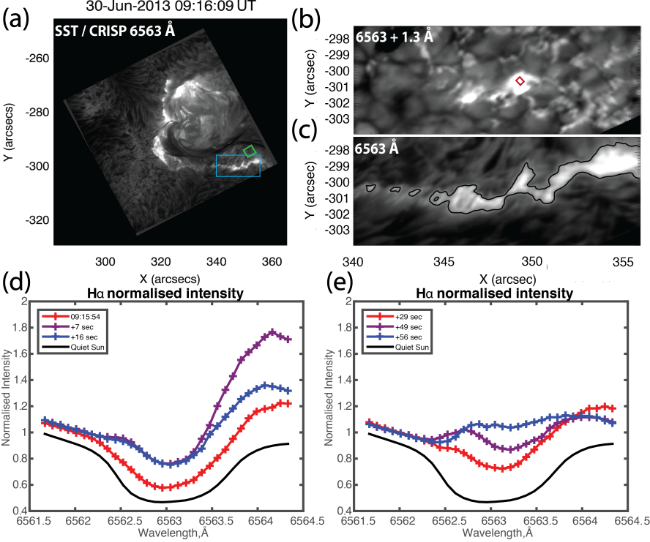 Modern radiative hydrodynamic models account well for blue-shifted emission, but struggle to reproduce closely the red-shifted Hα lines observed at the flare onset. Here we present a joint hydrodynamic and radiative model showing that during the first seconds of beam injection the effects caused by beam electrons can reproduce Hα line profiles with large red-shifts closely matching those observed in a C1.5 flare by the Swedish Solar Telescope. The model also accounts for the timing and magnitude of upward plasma motion to the corona observed 29 s after the event onset in 171 Å by the Atmospheric Imaging Assembly/Solar Dynamics Observatory. The flare occurred on 30th June 2013 in active region (AR) 11778 from 09:11 to 09:27 UT (Fig. 1a). AIA observations in 94, 171 and 304 Å channels presented in Fig. 1b show rather variable signatures. 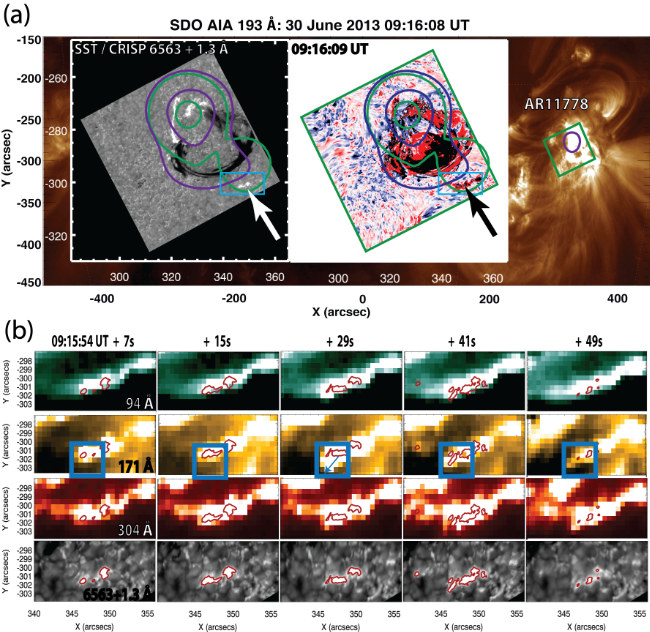 A bright, transient jet-like protrusion of plasma from the ribbon in the 171 Å AIA channel was detected between 15 and 29 s after the event onset, above a strong downflow regions in Hα emission (red contours) (Fig. 1b). The jet velocity in 171 Å, measured 29 s after beam injection at the location began, was 93 km s−1. At the same time, there are no jets seen in the 94 or 304 Å emission. Figure 1. (a) Context image of the flare. (b) AIA images for the hotter channels: Flaring/hot Corona—Fe xxiii 94 Å (top row); Corona—Fe xii 171 Å (middle row); transition region—He ii 304 Å. These were reduced and aligned using 1,700 Å images. The Hα line observation sequence from 09:15.54 UT to 10:17:18 UT was made at the SST using the CRisp Imaging Spectro-Polarimeter (CRISP) . The resulting Hα line profiles are shown in Fig. 2d, e. The CRISP observation captured the onset of a strong chromospheric downflow in the second ribbon area highlighted by the blue box in Fig. 2a, which is shown enlarged for the Hα red wing (Fig. 2b) and line centre (Fig. 2c). The red wing enhancement started in the 09:15:54 UT frame (Fig. 2d, red line), increased between 09:15:54 and 09:16:01 UT and peaked at 09:16:01 UT (Fig. 2d, purple line), 7 s after the flare onset. Figure 2. (a) CRISP observation in the Hα line core. The green box indicates the area from which the quiet Sun profiles were extracted. The area in the blue box is shown enlarged for (b) the Hα red wing (red box indicates the location from which flare profiles were extracted) and (c) the line centre. (d & e) show the extracted Hα line profiles. Figure 3. The simulated electron kinetic temperatures (a), macrovelocities (b) and plasma number densities (c) as functions of column depth. 1) In the hydrodynamic models we have employed  the initial conditions are those of the quiet Sun chromosphere in hydrostatic equilibrium with an isothermal temperature distribution (T=6700K) without a heated chromosphere, as opposed to the RADYN models that have an (ad hoc) heated quiet corona overlying either quiet (VAL-C) or flaring (VAL-F) chromosphere. 2) The beam heating function, and beam electron number densities are derived using the continuity equation approach [9, 10], which provides smooth heating functions from the top of the flux tube to the photosphere. This is in contrast to the flux conservation approach  which can lead to excessively high, sharply-peaked heating rates . 3) The non-thermal excitation and ionisation rates due to collisions between beam electrons and ambient hydrogen atoms are taken from the exact analytical solutions provided by Zharkova and Kobylinskii . 4) The hydrogen ionisation degree is governed by non-thermal ionisation by beam electrons from all levels of hydrogen atoms and maintained by radiative transfer in the Lyman continuum. Figure 3 shows plots of electron kinetic temperatures (a), macrovelocities (b) and plasma number densities (c) as functions of column depth calculated as a hydrodynamic response of the ambient plasma to injection of a power-law beam with the initial flux of 1010 erg cm−2 s−1 and spectral index γ=3. The initial QS chromosphere density is indicated by the straight line in Fig. 3c. The flaring transition region is swept by the beam towards 3 × 1018 cm−2, with the flaring chromosphere extending to 8 × 1019 cm−2 followed by a flaring photosphere (Fig. 3). The upward motion of flaring plasma is reflected in the macrovelocity plot (Fig. 3b) showing evaporation of chromospheric plasma upwards with velocities of about 93 km s−1s to the newly formed corona at the column depths between 1017 and 1019 cm−2) (Fig. 3b, box 1). At the same time, the beam energy deposition leads to formation of a low-temperature condensation in the flaring chromosphere seconds after beam injection begins (Fig. 3a, b box 2) with a slightly increased temperature up to 104 K. This condensation moves as a shock towards the photosphere and interior with velocities up to 55 km s−1 (Fig. 3b). The density of this shock is about 1013 cm−3 (Fig. 3c). The temperature profile evolution for the model between 5 and 100 s shown in Fig. 3a (see box 1) reveals that the plasma can be detectable in the temperature range of log ⁡T=5.2 to log ⁡T=6.05 at the depths of the low flaring corona. The 171 Å channel is the most sensitive to this range, compared to other available AIA channels. Moreover, the velocity range derived from the AIA 171 Å channel, averaged at 93 km s−1, closely resembles the predictions of the model of a hydrodynamic response to plasma heating by an electron beam for a given temperature range, as shown in Fig. 3a. Figure 4. 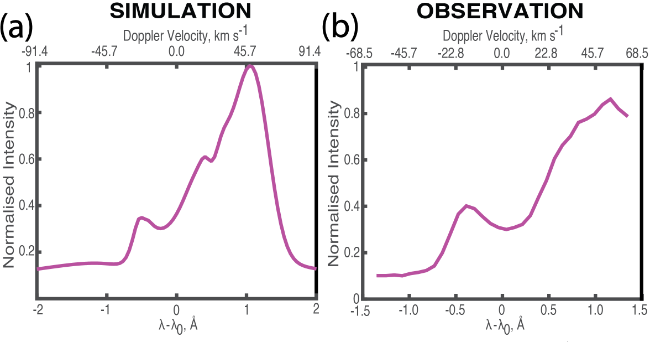 The enhancements in the Hα line profile over background levels (a) simulated 5 seconds after beam injection begins (b) observed 7 seconds after onset. The hydrogen radiative simulations clearly show that in the first seconds after the beam onset Hα line profiles are dominated by non-thermal ionisation by the beam electrons and the downward motion of the shock (see Fig. 3b, box 2). For this flaring event the beam has a relatively low initial energy flux about 1010 erg cm−2 s−1 resulting in a moderate increase of the Hα wing intensity (Fig. 4a). The horn in the near blue wing, about −0.5 Å from the central line wavelength (Fig. 4a), is in a normal position while the horn in the near red wing reveals a large increase of the intensity caused by a Doppler-shift of the emission wavelength caused by a downward movement of the hydrodynamic shock (Fig. 3b, box 2) up to 50 km s−1 at the times of maximum beam deposition. This comparison confirms that the observed red shift in Hα line is caused by beam heating with initial flux close to 1010 erg cm−2 s−1 , and the effects of more powerful beams are investigated in Druett and Zharkova . These results help us to resolve the biggest puzzle in interpretation of Hα line profiles with large red-shifts approaching 1-4 Å reported from the early 80s [1, 2, 3]. This study also indicates a need for broader spectral windows able to fully capture the dynamics of flaring events.